Currently there is almost a “free for all” in the use of printed electoral roll data. All sorts of companies, such as debt collectors and marketers make use of the printed electoral roll in order to carry out their commercial activities. There are huge privacy issues involved, which the law appears to be ignorant of, and there are people who therefore choose not to enroll to vote precisely because they don’t want their residential addresses to be made public. There are also increasing concerns about analytical manipulation of personal data, and cyber incursions, which is made more possible by advances in technology. So, if the electoral roll data gets into the wrong hands, there could be significant personal privacy breaches. And, of course, such misuse of electoral data could undermine confidence in the Commission and the electoral process. The risk is made worse by the fact that the political parties are provided with the electoral roll in electronic form. This is a provision designed by the politicians so that their parties can more effectively send election advertising to voters and so forth. It’s questionable whether the parties should be given this data, and it seems that it’s an accident waiting to happen, as there are no procedures or guarantees that any of the 16 registered political parties will prevent this personal data falling into the wrong hands. The Commission certainly raises questions about whether recipients really use the data safely and appropriately. I have a very simple suggestion. If the Commission is particularly worried about the electronic roll, why not put a couple different dummy names into the lists supplied to each party? Those dummy names could share an address with, say, the head of the Elections Commission. Or a cousin. If the fake names start getting mail in ways that suggest improper use of the electronic list, then the Commission could do whatever it does about that kind of thing. Sure, parties could guard against that by running the printed electoral list against the electronic one, but doing that would basically would require recreating the electronic list - unless there is stuff on the electronic list that isn't on the print version. Even suggesting that they have done it might be enough. The Government has hit back at International Monetary Fund claims that New Zealand's foreign buyer ban is "discriminatory", saying Kiwi homes should not be traded on the global market. IMF officials, in New Zealand this week, called the Overseas Investment Amendment Bill "discriminatory" and hinted that banning foreign investment in housing was an over-reaction to a problem that might not even exist. "Foreign buyers seem to have played a minor role in New Zealand's residential real estate market recently," IMF division chief for Asia and Pacific Thomas Helbling said on Tuesday. He added that there were other ways for the Government to respond if large volumes of unwanted foreign money suddenly flowed into New Zealand's property market. Associate Finance Minister David Parker said the Government disagreed with the IMF. "It's a matter of values," he said yesterday. "We believe New Zealand homes should not be traded on an international market." Except his government's bill does more than that. It hits a lot of people who live in New Zealand - not just 'overseas' speculators. And it makes it hard for developers to build new housing. If the developer is considered an overseas entity because it has more than 25% foreign shareholding - which happens easily if you're publicly listed - then there's more hurdles in front of your next project. If your planned apartment tower is going to be partially financed by off-the-plans sales to foreigners who'd rent the apartment out to Kiwis, and if there aren't locals who'll pay the same price off-the-plan, then you're going to have a harder time financing that apartment building. And there are a whole host of other problems too. Very few of the problems were caught in Treasury's Regulatory Impact Assessment, or more likely Treasury knew about it and chose not to say anything to avoid picking a fight with the Minister about the very obvious adverse consequences in the bill. I covered some of those off in a couple of pieces at The Spinoff last week. The first one went through how we wound up with a dumb ban on foreign buyers, and the second one went through a lot of the problems with the legislation as written. And I summarized in this past week's Insights newsletter. And it is darned depressing if Treasury pulled its punches in laying out the likely consequences of the bill in the Regulatory Impact Assessment for fear of getting offsides with the Minister. There is very little evidence that New Zealand homes are really traded on an international market. Banning people who live here from buying houses and banning people who would help get more housing built from doing so seem very bad ways of addressing the housing shortage. The former does nothing to alleviate any shortage because people who live here still would have demand for housing - they'd just shift from owning to renting. The latter makes it harder to get new stuff built. The only real way that foreign speculators contribute to a shortage of housing is if they buy a place and leave it empty. The housing shortage is the difference between the number of dwellings being built and the growth in demand for dwellings that accumulates over time. Empty houses can contribute to the problem. But there's no evidence that there's a growing problem in houses being held vacant, and no evidence that any vacant dwellings are disproportionately foreign-owned. And if there were a problem with vacant housing, you find a way of dealing with vacant housing rather than banning foreign buyers. Or, even better, just ease up the rules and make it easier to build so it doesn't matter if somebody keeps a house vacant for a bit. Twitter and Facebook comments on my Spinoff pieces lead me to believe that a lot of Kiwis think they'd be banned from buying houses abroad, or would face big hurdles in doing so - and especially in places where there are housing shortages. Let's take a spin. Please tell me if I have any of these wrong. Here's Experts for Expats on the rules on buying property in the UK - London included. London is crazy expensive. What are the rules? You might have trouble getting a mortgage if you're based abroad, but that's about it. A Kiwi can buy a house in London. A Brit won't be able to buy a house in Dunedin. San Francisco. That's the classic crazy one, right? Huge housing shortages. Could a Kiwi buy a house there without living there - and even maybe leave it vacant? Yes. Or I can't find any evidence there being any rules against it. Here's one real estate adviser website on it. Expect a few hassles around anti-money laundering stuff, but that's it. It'll just be proof-of-identity stuff. And that's the same for the whole rest of the US. A Kiwi can buy a house anywhere in the USA, regardless of whether there's a housing shortage in that city. An American won't be able to buy a house in Kapiti. The only place in Canada that has any kind of restrictions thus far is a tax on foreign home buyers in Vancouver. You can go and buy a house or apartment in Montreal or Winnipeg the same way that I could - by paying the owner of it. But a Canadian wouldn't be able to buy a house in Nelson. Heck, it will be easier for a Kiwi to go and buy a chateau in France than it would be for someone in Paris to buy a house Haast. And selling a house in Auckland could pretty easily let you afford a French chateau too. This isn't just making things even with other places that put restrictions on Kiwis. Other places don't do that. Or at least not other reasonable places like the US, the UK and Canada. The Labour government is putting more restrictions on a foreigner buying a house in New Zealand than even Trump has put in on foreigners buying a house in America. Labour seems to get a bit tetchy about being compared to Trump. On this one, they have out-xenophobed Trump by miles. The parts of the left that used to get mad about xenophobia have gone kinda quiet because their team's in office. If you think this bill is targeted at 'foreign speculators', you're deluded. The bill isn't written that way. It blocks people who live here from buying property. And since it does nothing to increase the number of houses available, and arguably reduces construction, it sure isn't a housing proposal. It's an anti-immigrant proposal. And if your answer is "Why should foreigners be allowed to buy houses in the first place? ", your whole morality is backwards. The presumption should be that voluntary transactions among consenting adults should be allowed, not the other way round. Banning people from doing things requires evidence of real harms to others. And nobody has provided any on the foreign buyer ban. I just don't get the fixation with making sure that nobody builds a house on agricultural land. The government plans to make it harder for councils to approve new homes and lifestyle blocks on productive land near urban areas. A report out today, called Our Land 2018, shows New Zealand's urban sprawl is eating up some of the country's most versatile land. It highlights that between 1990 and 2008, 29 percent of new urban areas were built on some of the country's most versatile land. Lifestyle blocks were also having an impact - in 2013 those blocks covered 10 percent of New Zealand's best land. Environment Minister David Parker said one area that was at particular risk was Pukekohe, known as Auckland's food basket. "We obviously need more housing around Auckland, but we also need to protect our elite soils. "So we are proposing a National Policy Statement under the Resource Management Act which will require the councils when they are planning where to allow subdivisions or even rural lifestyle properties, they'll have to make sure that they don't encroach upon our most precious soils." Mr Parker said the horticultural sector had been saying for some time that too much of its best land was being lost to housing and lifestyle blocks, and it was time to take some action. First up, it's probably worth agreeing with one bit that the anti-sprawl people have right. Zoning in Auckland is stupid. It is stupid that people who live on major transport and passenger rail corridors can't turn their houses into apartment buildings to accommodate a lot more people. All of the restrictions against building up encourage building out instead - to the extent that that is allowed. And if infrastructure charging is wrong, that problem will be compounded. But the solution to that problem isn't banning people from building out. The solution to that problem is a massive upzoning everywhere in town combined with congestion charging and better user-pays forms of infrastructure delivery like special purpose tax vehicles to pay off the bonds levied to put in infrastructure kit needed for urban expansion. And it's very much worth fixing all that. But suppose you have an agricultural paddock near town. The land can produce horticultural crops worth, say, $1m per year net after costs. The present discounted value of that stream of profits gets capitalised into the price of the land. And so the price of the land will already reflect peoples' expectations about the value of the agricultural produce that will come out of that land over the long-term. If a developer is able to pay the farmer more than that, that tells us something important. It tells us that the value of that land in housing is higher than the value of that land in agricultural use. The value of all the agricultural output is already accounted for in the price of the land. So you really don't need to protect valuable agricultural land from developers. The price of agricultural land already does that. If for some other policy reason government has decided to artificially subsidise building on that land as compared to other places, the solution to that isn't banning the development, it's getting rid of the subsidy. Shift the infrastructure to a user-pays basis. Banning development on that land only makes sense if you really really believe that the person putting in the ban knows better than either the owner of the land or the purchaser of the land the future price path of agricultural products or dwellings. And in that case the person putting in the ban should just be buying the land directly and reaping the huge and obvious profits from knowing better than the market about futures prices. We got into this stupid housing mess because the "Let's protect Precious Agricultural Land" people teamed up with the "Let's protect Precious Neighborhood Amenity" people and banned anybody building anything anywhere. I get depressed when a government that came in promising to fix the housing crisis screws this stuff up. Update: To address the likely first objection before it shows up: you don't have to worry about the "what if everybody did that" scenario. If land were being bid out of agricultural production and into use in housing, then the expected future price path of food would be a bit higher than otherwise - and the price of the next bits of agricultural land will be bid up. We do have access to imports too. And to address the second likely objection - if you're going to complain about the cost of food rising as consequence while ignoring that the cost of housing would drop, and ignoring that food can be imported while housing can't - there's something wrong with you. Looks like folks are back to arguing about whether there's a J-curve in alcohol consumption. The J-curve plots out the relationship between all-cause mortality and drinking. Non-drinkers are at the left-hand upwards tip of the J, light-to-moderate drinkers are in the dip, then heavy drinkers are in the upwards tilt at the right hand side. And the ballpark numbers I keep in my head on this are from Di Castelnuovo and Donati's metastudy from 2006 that has light drinkers (about a drink a day) with a relative risk of about 0.84 as compared to non-drinkers when former drinkers are excluded. The Lancet has a piece up that the press are covering as showing no J-curve. But they start their curve with a reference category of light drinkers: people consuming a small amount of alcohol per week. The J-curve normally starts with non-drinkers as a reference category. If you pull the non-drinkers out of any J-curve, then you'll have a hockey-stick instead: no downward tilt followed by a sharp upwards lift. And, as Chris Snowdon points out, they do have the standard form buried over in an appendix. Page 31 of the appendix. I've copied that figure below. The one on the right is the all-cause mortality one. Once you put non-drinkers back in, you have a J-curve again. If you also have ex-drinkers, you have a sharper J-curve. The ex-drinkers are the even higher risk folks at the far left. The reference category are people consuming from 0 to 5 standard drinks per week - so a bit under a drink a day. The category that always has the lowest all-source mortality because they're drinking a bit less than a standard drink per day. And the risk from drinking about 4 standard drinks per day (300 grams per week) is the same as the risk among never-drinkers - with much higher risk beyond that. The same as we've known since Donati 2006. Am I missing something? The newspapers are yelling about how the study means there's no J-curve. Trump's made some noises about seeking to join the CTPP agreement - after having pulled the US out of the TPPA negotiations. Should the CTPP countries let him in? Recall that Trump's steel tariffs, from which Australia are exempt but New Zealand is not (or at least wasn't when last I checked) were justified on national security grounds. WTO Article XXI allows tariffs to protect industries critical for national security. The tariffs weren't put in place for national security. They were put in place for domestic political reasons or because of demons in Trump's head. But try proving that quickly or cheaply in a WTO dispute tribunal. The CTPP has similar protections built in. These kinds of provisions (standard in trade agreements I believe) work among states that you can expect to behave like adults. The United States isn't like that currently. Why let them in? If they are admitted, what are the odds that Trump just invokes security exceptions again to undo whatever's negotiated? There's risk we'll have eaten dead rats on copyright only for Trump to declare butter in need of protection for national security reasons. The Fairfax papers have a good summary out today of what's going on in vaping - as of a month ago. When British public health experts first said vaping (using e-cigarettes) poses only a fraction of the health risk of tobacco smoking, the trend surged in popularity around the world, including in New Zealand. But it remains illegal to sell or manufacture nicotine juices, or devices here. So how come there are shops openly touting vaping products containing nicotine? Currently, it's legal to import juices containing nicotine, but only enough for personal use. Nicotine juices and devices, however, still cannot be legally sold in New Zealand. But anyone who vapes knows stores sell those products anyway, and aren't likely to get prosecuted. Basically, the law just isn't enforced. But I don't know that that's right anymore. Let's put up a giant caveat here first though. I Am Not A Lawyer. This Is Not Legal Advice. The Court decision in the Philip Morris case on their Heat-Not-Burn said that the SmokeFree Environments Act [SFEA] doesn't apply to oral tobacco products unless they are used in a manner sufficiently similar to chewing. That's the bit that was used previously to block the sale of vaping and Heat-Not-Burn. Unless the Medicines Act restrictions on nicotine are read as applying to nicotine formulations used in vaping - and nobody seems to know whether it should be read that way - vaping and sale of all the associated kit is legal in New Zealand. And it's also important that the judge said that the restrictions on reduced-harm products were contrary to the purpose of SFEA. I expect that means that that same judge would not look kindly on back-door efforts to bring stuff back under SFEA - or on other attempts to sue manufacturers and distributors of reduced-harm products through plain packaging rules and the like. That's it on the law stuff. Was a bit surprised that it wasn't mentioned in the piece. But we still have a ton of uncertainty out there. Nobody knows if the Ministry will appeal. Whether or not it appeals, it can still choose to implement a regulatory framework for reduced-harm devices. And Nicky Wagner's member's bill is sitting in the ballot that would bring vaping back under the SmokeFree Environments Act - that bill was relatively liberal relative to the status quo of a few months ago, but is very restrictive relative to what I think the current status quo is. It sounded good in theory. Interventions targeted at youths could very plausibly have been rather more effective than programmes targeted at older cohorts. 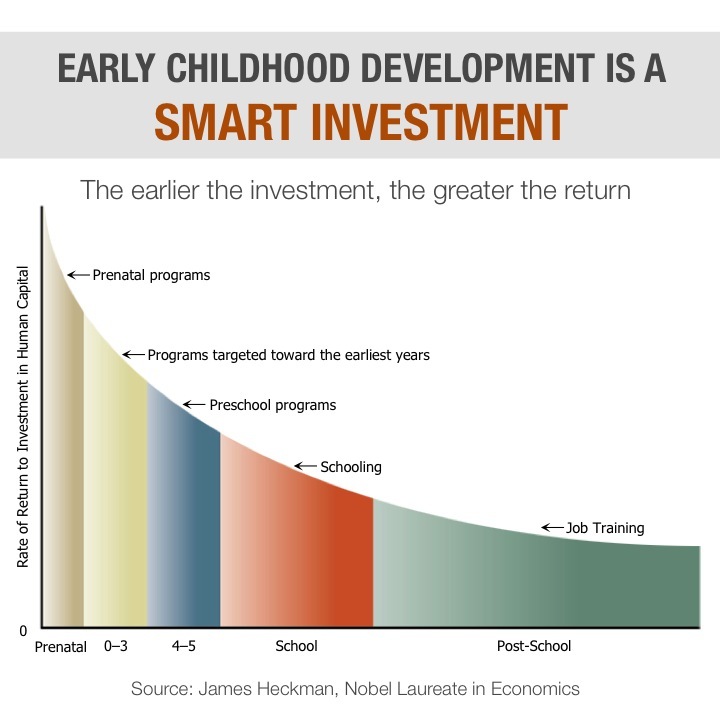 Heckman's foundation thing made a pretty infographic about it. But it's fundamentally an empirical question. The infographic is based rather more on intuition than on any real lit survey. Rea and Burton checked it out. They went into the big Washington State intervention database, sorted interventions by age, and just plotted out the cost effectiveness. There was no curve - just a noisy mess. And the regressions found nothing either. Here are the key tables. Figure 3's the kicker. Compare it to the stylized Heckman curve. Ocular least squares really are enough here. It also links into my other worries about the Perry preschool stuff that Heckman's been pushing and that seems really not to have fared well in broader roll-outs in Tennessee or in Quebec. If there is a Heckman Curve, it's hard to see it in the programme evaluation work compiled in the Washington State database. I sent this off to our school this morning after hearing the morning news on Radio New Zealand. Radio New Zealand this morning reports that a lot of schools are contracting with some security company to provide lockdown drills. I'm writing to ask whether our school is doing this, and if it could please consider not doing this. The baseline risk of a shooter in New Zealand is exceptionally low. The kids hear about that kind of stuff on the news, and they're comforted that we chose to live in a place where that kind of thing really doesn't happen. While drilling for this kind of thing can feel like making the kids safer, it really doesn't where the background risk is low and where the drill itself is a kind of a harm. It puts a terrifying scenario onto kids for no particular benefit. Earthquake drills make sense because the background risk is far from trivial - they need to keep that stuff front of mind. They don't need the drills for shooters. Please don't bring these guys into our school. I hope that we get a reasonable answer back. But it is depressing that this part of the Asylum Wall is crumbling. So I put in an OIA request for the Martin Jenkins final evaluation report on partnership schools performance back in February. The government looked set to be shuttering the things and I was keen to see what evidence was out there. I should have gotten the request in earlier, but I was expecting that somebody else would already have been on top of this one. Guess not. I made my request on 19 February, splitting it into three parts to make it simpler. The first part asked for the terms of reference, timelines, dates, correspondence and briefings on it, and expected publication date for the final report. The second one asked for any preliminary drafts of the final reports, in case there were holdups in getting the final report. And the last one asked for the final report. Simple enough, right? Delays in the final report should have at least gotten me the drafts. A phone call from the Ministry suggested a down-scoping that might hurry things along. They wanted to restrict the dates to after 1 March 2017 and exclude correspondence. Smelling something fishy, I said "Now wait a minute. Sometimes Ministries seek a clarification so that they can re-start the OIA clock. You're not doing anything like that are you?" And the Ministry assured me they weren't. I made clear that I wouldn't agree to any changed wording if it meant they were going to restart the clock. And then I sent them a note agreeing to the clarification on the condition that it wouldn't change the dates. The correspondence would have been nice, but even nicer to just get the report. The OIA clock had it all due on 19 March. I received an extension letter on 26 March telling me that they'd restarted the clock because of the clarification of the date. Nice. After they told me that they totally weren't going to do that. The Ministry replied they could do that at their sole discretion so nuts to me. More the fool me for believing what the Ministry told me on the phone. I'm told that it's odd for the Ministry to push an extension after having already secured an agreed down-scoping. Anyway, it's all sitting with the Ombudsman. And then, on Friday, the report showed up on the Education Counts website. I found out about it by Twitter, when Seymour's office noted that it was out. And then when I went through emails I hadn't looked at on Friday, there was one from one of the partnership schools lauding how well it did in the report. So I guess I would have seen it Friday if I'd been a bit less busy Friday afternoon. Maybe it went up earlier than Friday - I couldn't tell. So - the Ministry stonewalled the OIA request for the report, then never told me when it quietly went up on their website. I've still not heard back from them. I sent them an email this morning letting them know it's on their website in case they hadn't noticed it. What's then the explosive stuff that the Ministry's been so reluctant to release? Nothing, really. Survey results from parents and students at some of the partnership schools with uneven response rates and that doesn't compare results with traditional state schools. They didn't compare outcomes because there was no comparison group available - I would have thought that you could put together a matched group of students through IDI. number of stand downs and suspensions - with comparison for those same students at their prior or subsequent non-partnership schools. Students at partnership schools look to have substantially lower numbers of standdowns while at the partnership schools - but you'd really want to check against other students who flip around among state schools and compare with their currently attended school. The rest is all survey data from parents and kids about why they chose the partnership schools. The parents answering the surveys look pretty satisfied, but we have no comparison group of comparable students at state schools and little sense of whether the parents answering the surveys are representative. Parents generally find things at their current partnership school better than at their kids' prior school, but the same could easily be true of any other group of students who recently shifted from one school to another school - people change schools when they didn't like the last school (or when they move for other reasons). And that's about it. There's nothing really in there that would let you know whether the partnership schools are doing well or doing poorly. And since all the parents would have been answering the survey questions under the cloud of "You know, if the answers look bad, the government will likely close our school and you love our school right?, it's hard to tell what to make of any of it. Whatever your priors were about the things, there's no reason to change them. Folks like me who think parental choice matters won't have changed views about that, other than frustration that the prior government so completely screwed up setting an evaluation framework around the things that could have provided any kind of evidence as to effectiveness. It wouldn't have been that hard: baseline testing of all kids applying for partnership schools, randomised entry into oversubscribed schools, then annual testing of all the kids who applied regardless of whether they went to the partnership school. It all leaves me a bit baffled. Why stonewall a report that really doesn't have much in it? Why not just release the thing saying "Well, we don't really find any compelling evidence in this report either way, so we see no need to change our prior policy." I wonder if part of the problem was just that the report looks like it was delivered way late. All the prior stuff had suggested the report was due end-2017. The report on the website is dated March 2018. Why couldn't the Ministry have just said "Hey, the report hasn't been delivered yet" when we talked on the phone back in February? Maybe the stonewalling was less about avoiding embarrassing the Minister and more about having commissioned a report that really can't say much. Update: Nothing in here should be read as damning any of those schools - as I understand some have read it. The evaluation framework is the problem. From the response rates, it looks like one of the schools took the evaluation more seriously than did the others and worked harder to get responses back. But even if there were 100% response rates, without comparisons over in state schools, it's hard to say what any of the parent satisfaction numbers would mean. Would a lot of parents saying that they're happier with their current middle school than with their prior primary school mean that there's something in particular that's better about that middle school - or about that parents are generally happier with middle schools? Impossible to tell without baseline data on how well middle schools (for example) generally perform. Joe Bennett's superb piece on David Warner and Australian cricket. My preferred solution to Easter trading bans is to abolish them while making Easter a stat holiday. Just ignoring dumb rules is at least as good though. Mike Munger and Russ Roberts chat about congestion charging. Liam Dann talks with Treasury about its Living Standards Framework, along with a few cautionary notes from me. Otago's public health people, perhaps unsurprisingly, didn't like NZIER's take on sugar taxes. They've blogged on it here, but they seem to have missed a few important points. A Report commissioned by the Ministry of Health, written by NZIER, has recently been getting air-time as an argument against taxing sugary drinks. However, the Report seems to us to be seriously flawed. For example, the Report argues that soft drinks do not impose a negative externality. A negative externality is when consumption of a “good” (product) imposes costs on others. For example, it is universally accepted that tobacco smoking results in costs to society (eg increased health care spending), and therefore has negative externalities that justify tax. The same is true of sugary drinks increasing obesity/diabetes/tooth decay rates that then results in health costs to society. It is well recognised by economists that soft drinks impose such a negative externality, eg 2 ,5. Just as with alcohol and tobacco in nearly all high-income jurisdictions, this negative externality issue is a strong rationale for the state imposing a tax to help internalise the cost to society and cover some of the future costs to the health system. This is the minor point in their argument, but it is worth noting potential confusion on externalities because even some economists mess this one up. The ability to offload health costs onto others, either through insurance where the premiums don't distinguish between smallish changes in risk, or through a public health system, only generates technological inefficiency to the extent that it changes consumption. Think of it this way. There is a total amount that somebody's health care is going to cost. Imagine a world without a public health system and where private insurance premiums were perfectly adjusted to risk factors. Think about how much a person's health care will cost in that world in total. Then add back in the public health system or a less granular private insurance system (or one where they're compelled to use community ratings or somesuch). By how much does the total spending on that person's healthcare increase because they're able to offload the costs of unhealthy diets and the like onto other people? The increase in the risky behaviour associated with the cost-offloading imposes a technological externality. But not all of the cost associated with that is a net social cost either! The person engaging in more of the risky activity gets some benefit from it, and that benefit needs to be netted out. The net social cost is the excess of the extra bit of cost over the extra bit of benefit. If you want a measure of the "social cost" of sugar or whatever, you should be looking to that little triangle rather than the total quantum of cost. So we should never be looking at the total health costs associated with some kind of consumption - just at the cost associated incremental change caused by the ability to offload cost. All of the rest of the health cost is a pecuniary effect: it changes the identity of who pays for something rather than the amount paid. And even when we're looking at the incremental increase in the cost, part of that too is a transfer rather than deadweight cost. Ok, enough about that. We covered it in Jenesa's Health of the State report, and I'd covered it here before. Keep that in mind. They're only looking at English-language, peer-reviewed papers published from 2012-2017. The literature reviewed by NZIER also seems rather incomplete. Eg, for the 9 studies that we are aware of which have examined the impact of real world sugary drink taxes on health – the NZIER Report refers to just one of them.6 The missed ones include studies suggesting health favouring associations for BMI/obesity7 8 9 10and for reduced cardiovascular disease11; along with studies showing no benefit for health.12 13 14 Yet even for two of the latter studies finding no association – the authors suggest the null finding is probably because of very low tax rates in the studied settings and they recommend higher tax rates.12 14 We are also surprised as to why the well-publicised report from the Australian Grattan Institute on sugary drink taxes published in 2016,2 was also missed by NZIER. Perhaps as a consequence of a suboptimal literature search strategy, NZIER have missed some key information and this may have limited the value of their conclusions. Now let's check those references. 6 is Fletcher et al, 2015, published in Health Economics. This was included in NZIER's review. 7 is Fletcher et al 2010, published in Contemporary Economic Policy. Remember that NZIER's review included papers published in the last five years. Since NZIER's work was in 2017, the earliest inclusion date is 2012. So it was excluded. But let's have a closer look, just for fun. Because this one is fun. Fletcher et al 2010 one does indeed suggest that while there is no effect of sugar taxes on outcomes, it could be because observed taxes are too low. Now what Otago either didn't know or didn't want you to know is that Fletcher et al 2015 is an answer to Fletcher et al 2010. The 2010 work posited that there could be bigger effects at higher tax rates - that there's a nonlinear response. The 2015 paper tests for that nonlinear response and rejects the hypothesis that the 2010 paper suggested for its null finding - there's no evidence of nonlinear effects within the range of observed taxes. So, the question for the Otago people then: is there any good reason to highlight a mechanism that the authors disprove in later work? I can think of a few bad reasons. And the only good way to include it would be with a health warning that the mechanism was kinda torn apart by the authors' later work. But it's all kinda moot since the study was restricted to work in the past five years. 8 is Kim et al 2006. That's six years before NZIER's window. 9 is a master's thesis from 2013. I think that's excluded by the restriction to peer-reviewed papers, but it's perhaps debatable for a thesis that's made it through committee. 10 is a 2010 paper, so two years before the window. 11 is a 2015 paper published in the Journal of the American Heart Association. So it meets the criteria. So it's arguably a fair call that it should have been caught in the search. It wouldn't have much changed the result since it's just a cross-sectional study across US states suggesting that states with higher taxes on soda also have lower odds of poor cardiovascular health, but it would be a pretty big stretch to draw anything causal from that. You need at least panel data work identifying on state-level changes in soda taxes. Otherwise how could you tell that other things aren't driving both policy and health outcomes? 12, 13, and 14 were all published in 2010 or 2009, and so are outside of the review window. And 2 is a Grattan Institute report that would have been excluded as it wasn't a peer-reviewed journal article. Otago didn't chide NZIER for missing the Initiative's report on sugar taxes, but it would also have been properly excluded as it also wasn't a peer-reviewed journal article. Ok. So the Otago People are mad that NZIER excluded a bunch studies that the Otago People know about. They didn't bother to check the exclusion criteria in the NZIER's paper, and instead jump to the next paragraph claiming that NZIER is beholden to Big Industry interests even though this report was MoH funded. On checking, it looks like NZIER failed to include one study that they should have included, but including it wouldn't have made a darned bit of difference. I suppose the Otago People could have complained that the review window was too narrow - I don't know why it was set at five years but that seems a reasonable window where sugar taxes are pretty new. But the complaint as it stands seems more than a bit off. My disclosure: the Initiative is funded by a broad range of corporate members including ones the Otago People wouldn't like. Their membership has zero influence on my views of the Otago People's work. It'll be interesting to see how the EQC debacle plays out now that it doesn't have a Minister committed to covering up the cracks by shifting the carpet around. Here are a couple things that Minister Woods could usefully have her team check in on. They're my working hypotheses about what happened in that mess, but they're not solid enough to have made it into our report. They're hunches. They're hunches that are difficult to test from outside the system on limited resources. And I hardly expect that the hunches are unique to me - they're kind of the shared mythos of Christchurch as of the time I left in 2014. Hypothesis 1: EQC was generous after the September 2010 quake. Probably too generous. EQC was sitting on a pile of money. We were going into an election. So everybody on the west side of Christchurch in National electorates (in the west of town, closer to the quake's epicentre) got a home makeover if there was a crack in the paint somewhere. Is this true? We sure had the impression it was true, and there are tons of anecdotes around it. If it's true, how much money was wasted there that might have been put towards later repairs? Hypothesis 2: After February, EQC systematically downscoped repairs as the extent of the shortfall in its reinsurance relative to its claims became clear. I think EQC saw its main job as minimising cost overruns to central government and the draw on central government resource rather than playing straight with its claimants. Full foundation jobs became jack-and-pack. Leveling floors to as-new became "pretty level" MBIE good-enough standards rather than what was in anybody's insurance contract. What EQC's now blaming Fletcher for (Fletcher project managed a pile of the repairs*) is very likely a consequence of scopes inadequate to the scale of the damage. And blaming Fletcher for accepting crappy scopes of work is a bit off where it was darned hard to fight EQC on the scope. EQC downscoped ours two or three times - and our opt-out builder got some of it back through variances as the project continued. So check back on how final scopes of work varied from the initial scopes. What fraction of them were downscopes? Is that fraction consistent with what we'd expect in the normal course of assessment as you get more certainty about the actual damage? Is there data on the actual qualifications of the folks who did the assessments, and how that correlates with the scopes of work and whether it's now a munted repair job? With the change in government, we now have some chance of figuring out what the heck all happened in Christchurch. In related news, I'm still chasing Lloyds of London to see whether they'd sell me a parametric insurance policy that just gives me a pile of cash if there's ever a Wellington earthquake of comparable size to Christchurch's. That's simple to define for a parametric contract, but where it's a market of just me, it's likely not worth anybody's time to build the contract. I'd expect that anybody who ever had to deal with EQC would be interested in purchasing actual insurance instead of the "let's pretend you're insured" product that we wound up having. And I also hope that Minister Woods will not delay overmuch in flipping the EQC arrangements so that people only have to deal with their private insurer and EQC just writes cheques in the background. * Fletcher's is one of our members at the Initiative, so disclosure on that. We made a point of opting out of Fletcher's project management when fixing our house in Christchurch because we'd already, after September, sourced a builder who specialised in the kind of 1930s weatherboard place we had. We didn't want luck-of-the-draw builders assigned by some other project manager. In 2011, when Fletcher was given the job (I was at Canty at the time), it smelled funny to me. So I did some quick-style work looking at the effects of the earthquakes on Fletcher share prices and I just couldn't see anything there. I concluded that even if a centralised project management office wasn't the best idea, Fletcher didn't seem to be getting rents out of it. On the plus side, it's great that people are recognising human rights implications of housing. On the down side, people draw the wrong lessons from it. Decades of having enabled NIMBYs to block new development, both intensification and expansion, caused the housing crisis. There are big incentives and local government finance issues underlying it, and sorting that out would fix the crisis. There are plenty of affordable housing markets around the world - even ones where housing has remained affordable despite population increases. Those places have different incentives for local government - either broader and more encompassing local tax bases or access to project-based financing for infrastructure roll-out (like MUDs or special purpose tax ratings areas). So the lesson should be that whatever right people think they have to a neighbourhood or town that never changes, that right conflicts with other people's right to develop their own properties and winds up infringing on ability to get a house more broadly. Housing shouldn't be seen as a positive right, because that implies a reciprocal obligation on somebody else basically to buy you a house. But at least we shouldn't be setting up zoning rules or local council incentive structures that make it damn near impossible for anyone to build more housing. It doesn't just infringe on others' right to build on their own property, it also massively infringes on other people's ability to find housing. Instead, what are folks drawing from the housing crisis? "Good housing is not something that some people are entitled to and others are not. It is a human right. "We need to make sure our housing is accessible for the elderly and people with disabilities, that it is insulated and safe to live in, and that there is enough supply to meet demand." The HRC's submission to the UN committee made several recommendations for action on housing, including increasing the provision of social housing and improving tenure rights for renters. Fix the rules blocking housing first. That will solve most of the problem. If there are remaining issues once you've got property markets working properly again, then that's likely an incomes problem that should generally be addressed by incomes interventions. If there's anticipated demand for housing suitable for the elderly, people will build it - unless you're only allowed to build a small number of houses next year. Layering a pile of other restrictions on top of the current mess to try to make it more bearable risks setting up things that will make recovery harder once we finally get to the underlying problem. The incidence of a lot of regulation around rentals will fall on landlords when rental markets are relatively inelastic, but that flips to falling on tenants when housing markets become more elastic.